Our days contain hundreds, maybe thousands, of small simple things that have the power to make us happy. Unfortunately, these simple things are so small and so common that they are easily overlooked, ignored or forgotten. Let’s give them power again. Let’s allow the simple gift of daily living to bring us joy and enrich every aspect of our lives. To make it happen, we need to recognize, enjoy, and remember the blessings we take for granted. Here are a few recommendations. 1. Be aware. Every once in a while, stop and look around you. What is going right in your current circumstance? What is making your life easier? What are you grateful for? Is there any beauty or inspiration you typically overlook? 2. When you recognize one of these simple joys, take a moment to appreciate it and think about how it makes you feel. 3. Write down everything you recognize and maybe some notes about why it makes you happy. 4. At the end of the day. Quickly review your list. - My wife sleeping peacefully as I get ready for work. I know that in a few minutes a screaming baby is going to disturb her rest and she’ll be changing diapers, wiping a snotty nose, washing spit up out of her hair, and just trying to maintain order all day, but for now she gets to rest, and that makes me happy. - Heavy rain. I looked up and let it fall on my face for a few seconds and splash off my glasses. I enjoyed the feeling and the sound. It helped put things into perspective. It’s raining because it’s raining. The rain doesn’t care if the Democrats or Republicans are in power. It doesn’t care if we’ve built structures to protect us from it. It doesn’t care if I’ve just had my car washed. It reminds me that there’s a bigger world out there than the small bubble I’ve created for myself. - The speed of the internet. I was curious to know how old Willie Nelson is. It took me less than 15 seconds to find out. Wow. Your list doesn’t need to be this detailed. You just need enough information so that you can recall the feelings you had at the end of the day. So what if things go wrong at work, allergies make me feel like a zombie, my car doesn’t start, and I miss Seinfeld? 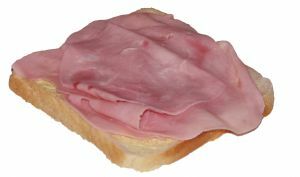 A serving size of ham is 10 slices and I choose to give that fact more power to make me happy than the power misfortunes have to make me sad. Thanks for the advice, Coach Vaughn! Today I'm thankful for being able to sleep in. I'm also thankful that when I woke up, I saw this article. I read a lot of your posts and almost always find an opportunity to tell someone else what I've learned. They are usually in need of a little help, which your posts seem to have the answer for! So thank you for being inspiring and changing people's lives! I love what you have to say here. My mom & I like to chase rainbows. Being from the Texas Panhandle we don't get much rain so rainbows are a treasure for sure. There is beauty & blessings all around, you just have to open your eyes to it. Thanks again!